Another Sunday, and time for another weekly recap. I am doing this earlier, as I am taking a break from re-arranging my real life closet. Taking break from Stardoll too, as, after the newest LE collection, I am broke. Like literally broke, 0 stardollars. And that happens rarely to me. But I don't think you want to hear me rambling about my stuff, you are here for a recap, right? If so, read on. Monday seems to have become a day for 'ordinary clothes' releases- this Monday, we got new Bonjour Bisou collection. Clothes came in mostly blue, black, yellow and gray colors. There are some interesting, nice pieces. Nothing, thought, really caught my attention. Except for the few starcoin items, they look ok. I don't really know if many bough anything, as my guess is people were/are: 1)waiting for a clothes to go on sale, and 2)saving up for new LE. But if I had to pick my favorite, that'd definitely be a black and white striped maxi dress. Which I plan on buying, but will probably wait for a sale. 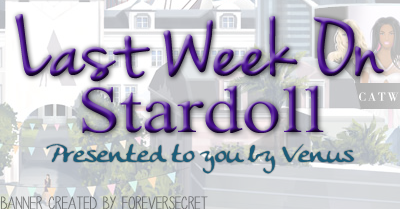 On Wednesday, Stardoll announced August HotBuys. They caused a bit of controversy, one particular item to be exact. The collection is an average one, with some nice pieces - I love the jeans and the pink dress. Yeah, leather skirt looks nice as well. Others are ok, nothing special. One item, though, caused a lot of drama - a s*it happens top. Now I really do not mind the design, and neither it does offend me. It may sound offending to younger users though. But many members agree that Stardoll is being a hypocritical, as they do not allow users to design stuff like that, or use the particular 'bad word'. I was expecting to see updated HotBuys, as many do find it offending, but so far, it is still there. The same day, we got 2 new floors of Fallen Angel interior. Finally, on Friday, we got a new Limited Edition collection. The Face of LE was chosen and we could all see her in Stardoll advert for the collection - the winner is xxewelina1996xx , and I congratulate you! The collection came out a bit earlier than usual, and I was lucky to be awake at the time. Now I am not an expert, but many members said that this is not what Grunge style stands for. When I first saw the items, I was like 'nothing much interests me, I'll buy only a few items', but I ended up spending all of my hard earned stardollars on a collection. I don't know why I always do that, spend that much money on stuff I don't particularly like, just because it is Limited. And I am sure I am not the only one. The interesting thing was, that there were some boy clothes - 3 outfits to be exact. And they are okay. I am just wondering, how many girls did buy boy clothes, just so they could re-sell them later. I didn't want to take that risk. Overall, an interesting week. Can't wait what I will be recapping in my next post. Until then, vote on the poll, and leave a comments (related to the topic, please), and see you next week.